← Feeding Tube Awareness Week 2014! When people talk about the NICU journey it is usually in reference to children who were born prematurely, but what many don’t know, is that there are many children who were born full-term (or pretty close to it) who end up in NICU due to congenital anomalies or other health issues. We fall in to the second category. I recently saw that a local non-profit requested letters to NICU parents from those who have been there that could be handed out as a welcome to families and to ease fears. I knew I wanted to contribute because it seems like families in NICU for anything other than prematurity often get left out and feel like they don’t belong. If I could hand a letter to parents in the NICU, this is what I would say to them. For those who also share this experience, what would you add? For parents of children in NICU who were born full term with congenital anomalies. First and foremost, Congratulations on the birth of your beautiful baby boy or girl! Secondly, I’m sure this has already been quite the rollercoaster and is not at all what you were expecting. Take a deep breath and know that YOU ARE NOT ALONE. I have sat exactly where you are and felt many of the same emotions. Our journey may be different, but we have many, many shared experiences. I hope this letter helps to ease your worry and helps guide you down the first few steps of this new path. My son, Braxton, was born full term and we had absolutely no idea we would need to be worried about him once he was born. Honestly, it was several hours before we knew anything at all. To our knowledge, we had a perfectly healthy 8-pound baby boy. Then, the neonatologist came in and our perfect little world came crumbling down. She told us that our son’s blood sugar was very low because he would not take anything by breast or bottle. She continued on to say that there were some features that pointed to some kind of syndrome. His eyes were wide set, his nasal bridge was flat, his head was very small, his ring and pinky finger on both hands were fused together, and his toes were crossed. She also thought she heard a significant heart murmur. But, she could not definitively say he had a particular syndrome, only that he needed to be transported to another hospital to undergo testing. 12-hours after birth, my son was taken away to another hospital, without me. I was devastated. I’m sure you are too. I remember sitting in the NICU thinking, my child does not belong here. As I heard the nurse tell a mom that her son gained a few ounces and is now a whopping 4 pounds, my heart fell. Here I am with a giant 8-pound baby while the baby across from him is only half his size. I don’t belong here. I said this over and over. I know now this period was critical in keeping my child alive and I am forever grateful to the experience in hindsight, but in that moment, I dreaded everything about it. My son spent 3-weeks in that NICU and had a g-tube placed and many tests done to determine the genetic cause of his abnormalities. The testing in NICU had no results. We learned of some conditions that affected his eyes, heart and brain, but we had no cause and no prognosis. After discharge, we began the marathon of therapies and specialists to help my son develop and to give us answers about what was causing his condition. Braxton was 21-months old before we had an official diagnosis. Now, he is almost 3 and doing extremely well. Much better than the neonatologist who first saw him ever expected. He is almost walking, he is finally eating by mouth and rarely uses his g-tube (we were told he’d need it for life), and he has taught us so much. We were deathly scared and angered and saddened and every emotion that you could think of in the beginning. We now know a joy like no other. Make no mistake, this journey is hard, but you can do it and it’s so worth it. 1. It’s okay to grieve. In fact, you really need to grieve. Grief is a natural part of the healing process. Your entire pregnancy, you were planning for this precious little girl to play dress up and create amazing art with, or a daring little boy who was going to be the next football star or karate champion. Now, here you are in the NICU and the doctor says they don’t think your child is going to make it, and if they do they will never do anything meaningful with their life. (We’ll get back to that in a minute.) Your whole world is crushed. Believe it or not, you just lost a child. Yes, the child you birthed is here and living, but the child you dreamed of has passed. The realization that you may not get to do all the things you planned, hits you like a bus. It’s okay for you to be sad about that, angry even. Mourn the loss so that you can move on to caring for the child you have in front of you. You will build new dreams. You will find ways to make the dreams you had come true. There are accommodations for everything. I know of so many children with special needs who play sports, dance, do karate, swim, and so many other amazing things. The dreams you have for your child can still come true, it just takes a little more work and you might need to make some adjustments, but it can happen. 2. No one has a crystal ball. There is not a single person on this planet that can tell you with complete certainty what is going to happen with your child. Our doctors do the best they can with the information they have, but they cannot predict the future. If the doctor says your child may not survive and if they do they won’t have a meaningful life, first, shame on them for saying such a thing, but second, the world is FULL of people who doctors said wouldn’t live for very long and I can tell you that every one of them has a meaningful life. If you have a diagnosis, understand that all diagnoses have a spectrum and every child with that diagnosis is different. The research can give you an idea of what to expect, but it is not absolute. Just look at children with Down Syndrome. There are children who have severe challenges, but there are also a lot of children who have only a few complications. Many of them grow up to hold full-time jobs and live on their own. And I’m sure all of them at some point were told “your child may never crawl/walk/talk/live on their own/hold a job/etc.” You never know what could happen. Never, never, never lose hope. 3. You know your child best. Yes, your doctors went to school and have many years of experience, but your child is your child and no one knows your child the way you do. No book and no amount of experience could let anyone be the expert you are when it comes to your child. You are the one with him/her day in and day out. Always trust your gut and don’t be afraid to stand up to a doctor. Believe it or not, sometimes they are wrong. You are the advocate for your child and you will have to fight for everything they need. Just because a doctor says “well children with X,Y,Z Syndrome typically don’t have severe GI issues, so it’s probably just reflux,” does not mean you stop there if your child is projectile vomiting their entire feed, every single feed. There are lots of tests that can be done to investigate the issue further and just because THEY have never seen a child with X,Y,Z syndrome have the issues your child has, does not mean that it is not possible. When in doubt, always know you have the right to a second opinion. 4. People mean well, but they almost always say the wrong thing. For us, we hated when anyone told us “Well, things could be a lot worse.” Braxton’s dad would usually quip back, “Yea, well things could be a lot better, too!” Other things like, “You know, God only gives special babies to special parents” or “God would never give you anything more than you could handle” or “he looks normal to me!” And then somewhere along the way you get promoted to sainthood with comments like “Oh, I just don’t know how you do it!” or “God sure knew what he was doing when he gave you that child.” Or “I would just die if that happened to my child, you are so strong.” Um, thanks? I’m not stronger than the person next to me, I’m just a parent and that’s what parents do. We rise to the occasion, because who else is going to do it?? We are strong because we have no choice but to be strong. I get what people mean most of the time, but it still stings a little. And, if you are like me, after a certain point you just want to hit the next person who says something out of place. You learn to ‘grin and bear it’ or use the opportunities to educate the person who says the wrong thing. Just know that even the most ridiculous things often come from some place with genuine sympathy. Also know, that sometimes people are just downright mean, and those people don’t deserve your time. If you are quick-witted you may be able to educate them and put them in their place quickly, but most of the time you are so stunned at the sheer audacity they had to say such a thing that you just stare blankly. If that happens, just move on, they don’t matter in the grand scheme of things. 5. You WILL learn everything you need to know. I remember getting ready to discharge from NICU and a nurse going over operating the g-tube pump one more time and thinking how in the world am I going to remember all of these steps. Just before discharge the nurse went through all of the paperwork with me and discussed the specialists I needed to call for follow-up appointments. We were discharged with what seemed like, a mountain of medical supplies and a long list of people to call. I was overwhelmed. I didn’t know where to start. I became more organized than ever. I made charts, spreadsheets, journals, and kept detailed records. I created a medical records binder to store everything I needed for Braxton. As I realized that everyone wanted to know exactly what happened from the time he was born, what doctors he saw, exact dates, exact procedures, I began to maintain a timeline. This was very helpful in filling out the mounds of new patient paperwork. Eventually, I created a single page document with a list of diagnoses, medications, procedures, diagnostic imaging and surgeries. I have a spreadsheet that lists all of our doctors, their specialty, the reason they are treating Braxton, and phone/fax numbers for every one of them. These two documents have been the single most important for us, and our doctors really appreciate the “Cliff’s Notes,” so to speak, on Braxton. It is scary and overwhelming, but just take a deep breath and know that YOU. CAN. DO. THIS! Here is a helpful guide from Mommies of Miracles you can share with friends and family who ask how they can help you. 6. Don’t be afraid to ask for help or accept help when it is offered! This is a hard road and you simply cannot be on “go” 24 hours a day, 7 days a week. Caregiver Burnout is very real and can affect you and your family. You need to take care of YOU so that you can take care of your child. Don’t be afraid to ask someone to sit with your child so you can take a shower, take a nap, or step outside in the fresh air for a few moments. If someone offers to help, let them! Give people specific tasks that help you check off your to-do list and satisfies their need to help you. Ask someone to cook dinner for you, bring dinner to you, put gas in your car, bring you gift cards for the grocery store, or simply ask them to sit with you and learn about your child. People care about you and they want to help, don’t shut them out. 7. Take care of YOU! This should probably be number one! It’s okay to take a step back and take a deep breath. There are going to be many times along this journey that it is all simply too much to handle. Understand that this is natural and you have every right to take a break. Go get a massage, a manicure and pedicure, go out for dinner, just do whatever will help to recharge you so that you can be your best for your child. 8. Your relationship with your spouse or significant other will be tested. It’s a well-known fact that men and women process these experiences very differently. I wanted to talk about all of the possibilities, talk until things made sense, or simply talk for the sake of filling the silence. Braxton’s dad was not a talker. He’d listen to me for a little bit, but he’d almost always zone out or change the subject. He dealt with this in his own way. He buried himself in work and in music. BUT, he was at every single doctor’s appointment. He learned how to use Braxton’s feeding tube. He woke up in the middle of the night to change out the formula, change Braxton’s diaper, or simply rock him back to sleep. We became so tired that we lost time for ourselves. We stopped talking to each other. We argued about so many insignificant things that seemed important in the moment, but I cannot recall one life altering argument that impacts us today. Don’t let that happen to you. Make time for each other. Get a sitter, respite nurse, or close family member to stay with your child so you can spend time together as a couple. Have a date night and don’t feel guilty about it. If all else fails, don’t be afraid to go to counseling and find each other again. Do everything you can to remain a team, but just know that sometimes things don’t work out and that’s okay. 9. You will find your faith, or you might lose it. I have seen both sides of this coin. People who learn to see God in their lives through the miracle that is their child, and people who become so angry with God, that they begin to think that He is not present in their lives because of all the hurt and struggle they have faced. We struggled with our faith and were very much tested spiritually, but eventually we did find our way back and began to see things much differently. You will find your own path. 10. Understand that support is critical. We become so wrapped up in caring for our children that we often forget about our own needs. For so long, I thought I was doing just fine. I didn’t seek out support groups because I didn’t think I needed any. One day, I went to a meeting with a local non-profit for children with undiagnosed and rare disorders. I was hesitant at first and almost cancelled, but reluctantly, I went. That night changed my life and I didn’t even realize it until much later. U.R. Our Hope was exactly what I didn’t know I needed. I was able to talk to other parents who shared my experiences and truly understood my journey. We talked about doctors and how they could have the audacity to make us wait in their office for 2 hours for a 10-minute visit! I learned about resources available to me that no one had ever mentioned before. I became empowered. I listened to other parents tell their stories of challenging the system and advocating for their children and was in awe of the people who were before me. I found myself seeking out more virtual support resources as well. We live in such a digital age and I am so grateful. Virtual support groups can be just as helpful and fulfilling as face-to-face support. Just knowing that someone out there “gets it” makes all the difference in the world. Don’t be afraid to look for groups in your area and just jump right in with both feet. You won’t regret it. 11. Step away from the computer! 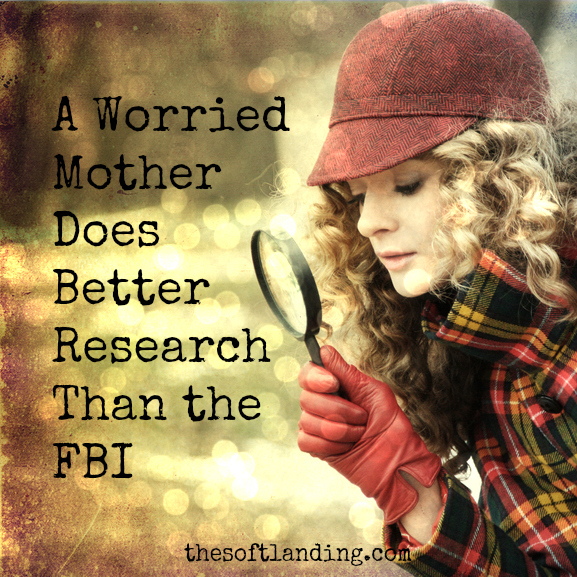 There is only so much research you can do before you drive yourself crazy. As you learn about new symptoms, new treatments, new possible diagnoses, definitely seek out information, but don’t waste all of your time on the Internet or in the library trying to memorize everything. You will burn yourself out and miss out on precious moments with your baby. You will also start to worry about things that might never happen. Some research is outdated and does not paint a nice picture. When we finally received our official diagnosis, I did some research and I did not like what I read. By this time, I had started blogging about our journey and when I shared our results and my research, someone reached out to me and said, “Hey, my son has this same syndrome and I know many other people as well.” I immediately reached out and asked to connect with everyone. I found a Facebook group and began to make connections. I learned that some of the children were playing sports and doing some truly incredible things. Many of the children were nothing like the research I had read. Hope was restored. When you do research add “Parent support for” in front of the diagnosis and that will help you find the support groups or blogs or just real life people who will gladly share their story with you. 12. Don’t isolate yourself or put limitations on you and your child. Unknowingly, we sometimes hold our children back because of our own fears. We did not go out to eat for quite some time because we were scared of what people would say if we had to feed our son with his tube in the middle of the restaurant. Only one of us would go to the grocery store or run errands because we didn’t want to interfere with a feeding time. We turned down friends invitations for dinner and parties. We kept our older daughter from doing things because of her brother. I quickly realized this was making her resent him instead of wanting to build a bond with him, so I had to find ways to give her the things she wanted so she could still have her ‘normal.’ You and your child deserve to do anything you would normally do if he/she did not have special needs. Tube feeding in a crowded restaurant is totally acceptable. At the park? At a birthday party? At Church? Absolutely! Always try to place your child in the least restrictive environment. Don’t feel like you can ONLY go to special needs parks or attend special needs activities. Try the regular park, try a regular dance class or baseball team. Sometimes all it takes is a few simple adjustments and your child is dancing and playing right next to his or her peers as they should be. 13. Always choose joy. 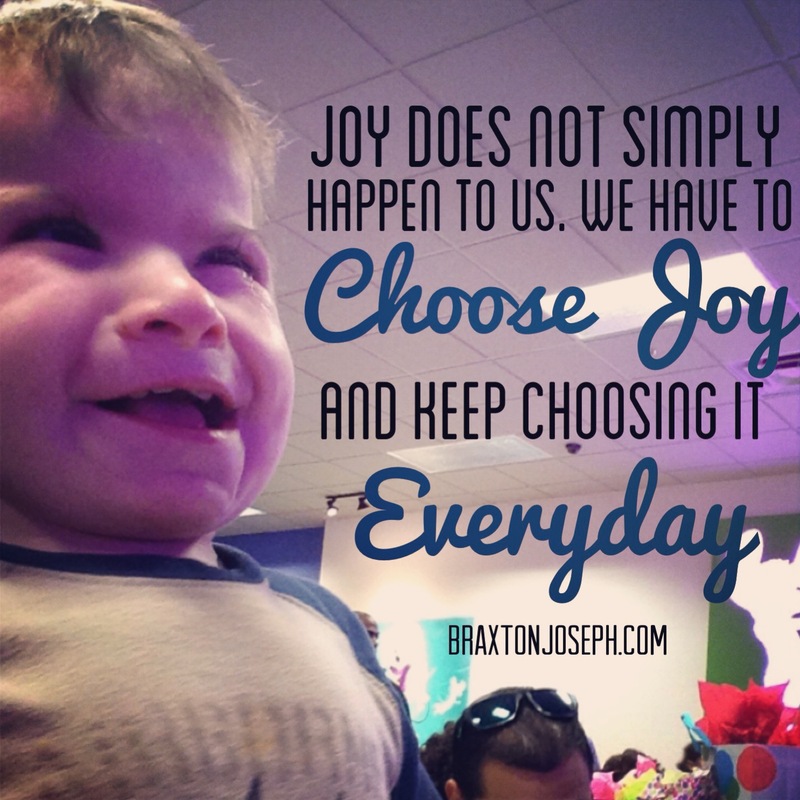 Joy is a choice. It is a conscious choice that you have to make each and every day. When you are going through a rough time, take the time to grieve, but pick yourself up and choose joy. This whole experience is only as good as you make it out to be. YOU control the mood and outcome. The things you choose to focus on are the things that begin to consume your life. You can choose to focus on the bad things that are happening, have happened or will happen, or you can choose to focus on the positive things that are all around you. Take some time every day to think about the good things that happened and the things you are grateful for in your life. Slowly, a positive attitude will come easy and choosing joy will become second nature. And then something even more amazing will happen; the joy will pour out of you and into the lives of others! I know that right now, this seems ridiculous, but trust me, you will get here. The fear and the sadness and the anger will subside. Sometimes those feelings will come back, but every time you will be better prepared and you will notice you spend less time with those feelings and more time with joy and happiness. Congratulations again on the birth of your beautiful child! I know things are scary right now, but eventually everything will be okay. Don’t be afraid to reach out to someone who has been in your shoes. We remember what it’s like and we want you to stand beside us, so we will gladly reach out our hand to you and pull you up. We will walk this path with you and help you find your footing. From this point forward, you are never, ever alone. My daughter (now 18yo) was in NICU for just four days. Since I had a C-section, I couldn’t manage visiting her except for just once, although my husband went often. It was overwhelming to be in there. I knew she would only be in there for a few days (they were monitoring her heart that quickly resolved), but I felt deeply out of place. Like she wasn’t “bad enough” to belong with all of the premies and “sick” babies. I think back to those days sometimes and wonder what happened to those families and their little ones. And yet, I know they never think about us, the temps. I know exactly what you mean! I also had a C-Section and I forced the doctors to release me the next day so that I could be with my son. They had transported him to a different hospital, but our insurance did not cover for me to transported as well. I hope your daughter is doing well now! I had a similar experience where I believed I was going to have a healthy baby boy. My labor went wrong, he came into the world via an emergency c-section and spent just seven days in the NICU due to respiratory distress, turning blue and jaundice. Those seven days felt like an eternity and once I got him home my husband had to go right back to work and we had no help. I knew right away something wasn’t right. We had to get third, fourth and fifth opinions. Our son is now 19mos old an we are *just* getting into Genetics after months of fighting and advocating. We have been to dozens of specialists, each giving us different answers! In the meantime, I lost my closest friends because they didn’t understand I couldn’t ‘just bring’ my baby places. I still can’t. He gets over stimulated, suffers from anxiety, has sensory issues and is globally developmentally delayed. I knew something was wrong and the people I trusted to ‘be there’ were telling m I was crazy or insinuated that I was unhappy and didn’t love my baby. I instantly cut that person out of my life. Becoming a mother in general can be isolating as it is but add in a kiddo with special needs and even more planning has to go into it and not everyone gets that routine is key and when I need to go, I am going!! My son has two rare conditions, a deletion of chromosome seven and a cystic lesion of the pineal gland in the deepest part of the brain. Both of which cause other issues and disorders including major sleep issues (with no relief in sight without major brain surgery), hypotonia, Macrocephaly, outwardly turned feet and a large wide open fontanelle. Most people don’t know what to say or understand that when I say he has trouble sleeping doesn’t mean that it’ just one night every now an then. It is every night. Every day. Every nap. It’s hard when babies born after him are surpassing him in milestones, especially when you are reminded that their kid can do that and they are a year apart. Every new goal and milestone we hit is a celebration. Why must everything be a competition? It’s just hard. The NICU was traumatizing an I felt so alone. Reading this brought me to tears but in the good way. Thank you for sharing. My story is similar. We knew there was something wrong before my son was born. We were told he would be stillborn or die soon after birth. I insisted they try anyway. He was passed into the NICU before I could even touch him. He was over 8 pounds (a lot was fluid) even though he was born at 35 weeks. Compared to the other babies in the acute NICU he was a giant! The preemie diapers they tried to put him in looked like a speedo! I was actually jealous of the other parents. Most of those 24 weekers had a better prognosis than my son. I went to a parent group for parents of babies in the NICU. I felt so out of place. The things they talked about had nothing to do with my son. I felt alone, even surrounded by other people. 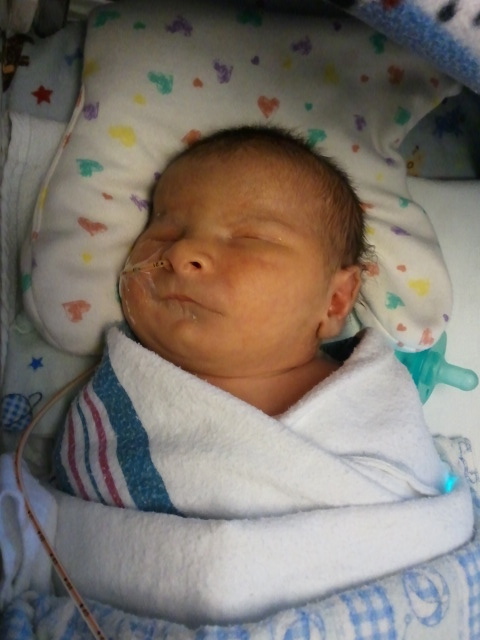 He was only in the NICU about 3 weeks and then we were told he needed to start dialysis, but they did not recommend it. Basically they wanted us to give up and let him die. We moved him to a different hospital in a different state. He made it until 10 months old before starting dialysis and when he was 5 years old he had a kidney transplant. He will turn 22 years old in April. A lot of the time I still feel alone and have a lot of scary memories of the NICU. I’m grateful that I was blessed with a miracle, but I wish that there had been more support for big NICU babies. Thanks for your letter. Wow, I am so glad you did not listen to the doctors! I agree there should be more support for us. In the early days I didn’t want to talk to the other parents in NICU or listen to anyone’s story because in my mind they didn’t understand and our experiences were very different. Even the NICU reunion in our area still focuses on the premature babies and I feel out place. I hope this letter finds the people who need to read it and together we can build support for each other. This is a great post. I am a former preemie so was a more typical NICU baby. Then again, my rather complicated constellation of abilities and dissabilities does often make me feel out of place. 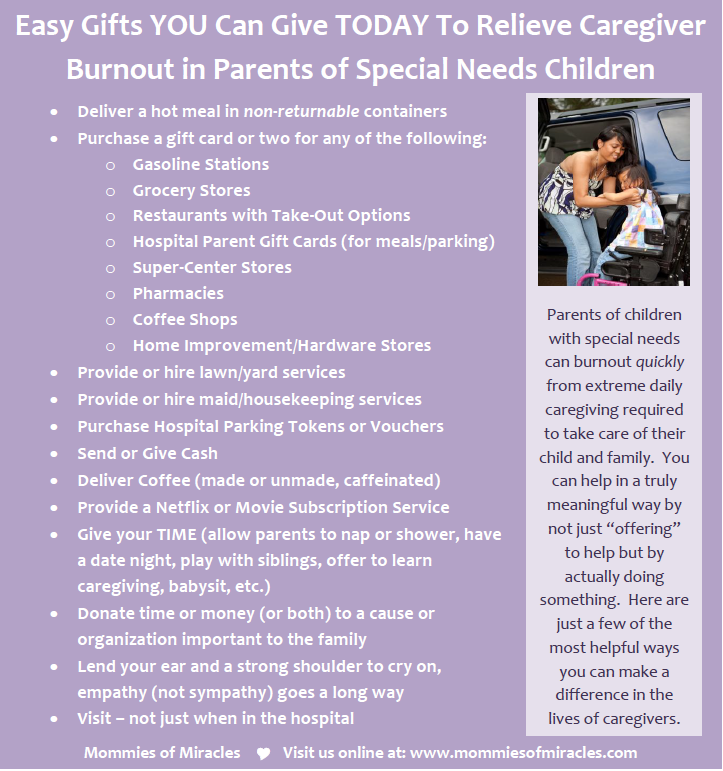 These tips you provide are great for any parent with a special needs child. I can see fromt he comments that at least some parents have gottent o feel like they have a place to belong through your letter. I’m sitting here trying to find the words… I am in Direct Sales, and a NICU-momma of a baby boy born at 39 and 6. Full-term! I asked my customers to donate a thermal tote to a NICU family. I have 51 to drop off on Monday. I have been struggling to find the words to put in a note to the parents (moms), because I felt so out-of-place in the NICU. Every new nurse came in and said, “oh, big baby!” He wasn’t! He was 6 lbs 15 oz–a whole pound smaller than my first son. I get it. I mean, when you walk down the hall, some of the babies would fit in the palm of my hand, but he wasn’t big! He was still my baby! Your words…are my words! Our stories are so similar. We knew our baby would be born with a cleft lip and palate, but were continually told it was very unlikely that we would need the NICU. Our stay lasted 30 days! He underwent all kinds of tests: ultrasounds of everything, genetic testing, blood draws, swallow studies, echo-cardiograms…then it all repeated itself. Eventually we had a g-tube placed, since feeding/nutrition were the only things keeping us there! 3 days later, I got a crash course on using the feeding pump, and off I went with all of our supplies. Thank you for writing this! I needed to know I was not the only one.